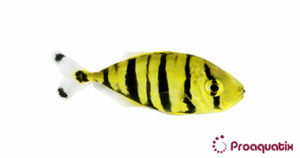 As a juvenile, the Golden Trevally have a bright yellow body with very distinguished black stripes. As they grow to maturity the yellow will fade into a golden/silvery color. As adults, they can grow in length up to 4ft. Found in tropical and subtropical waters of the Indian and Pacific Ocean, mainly in sandy and reef substrates. The Golden Trevally will school as juveniles and follow a pilot fish behavior by often trailing larger animals such as sharks. Usually ignores corals but will eat fishes and other invertebrates. Also grows large, whose output of dissolved wastes may be problematic to the maintenance of pristine water quality.